I inherited this guitar from my father who passed away in ’92. He had harboured, I think, an aspiration to learn some classical guitar for a few years, already, and so bought in a store when he came to visit us in London one year. I think he viewed me as a guide with respect to the buying side. In truth, I was all-at-sea with classical instruments, but at least I could judge its playability and make a rudimentary judgement about its sound. But an expert guide? Nah! My father had a keen ear for music – particularly for the symphonies of Sibelius. I remember as a child hearing most of the great romantic symphonies and concertos – he had a penchant for conducting the radiogram during the climaxes of these works. I was very proud when I introduced him Mahler’s symphonies because he he took to them immediately with great enthusiasm. His reaction to his first hearing of the finale of the Resurrection Symphony was a joy to behold. I was amazed at the time that he hadn’t come across them before, but I understand now that Mahler has only become really well known relatively recently and, incredibly, was hardly known except to champions of his work when my father would have been building his record collection in the ’50s. Anway, all that aside, on the guitar he made a none too shabby stab at Cavatina (aka the theme from The Deer Hunter) which he learned from the notation with John William’s recording of the piece as a guide. If his playing was a little stiff, that was soley due to his taking up the instrument late in life – late sixties, as a matter of fact. He was a very musical guy and I miss him. I have spent ages trying to find out about Takumi guitars. 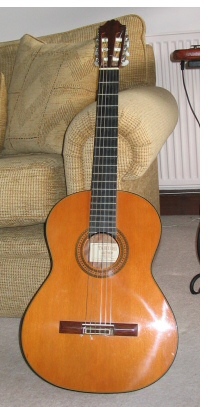 I have a Brazilian rosewood solid model TC125S. Many people suggest this is exactly the same as the Yamaha Grand Concert Model GC41.I contacted Ivor Mairants but received no reply. Do you know anything at all about this maker? I did a Google search once on the maker but got very few results. I kind of lost interest and the guitar is still in its case. Nice to have a solid Brazilian rosewood guitar, though. Congratulations! I find it very interisting to read about your takumi-guitar. I myself have the Takumi TC 130s. I am looking to buy a classical guitar and I see a Takumi for sale, I thought best to research it and came across your lovely recount of your father and his Takumi, this Dave is quite amazing. My father introduced me to Sibelius, and Mahler and believe it or not worked with John Williams many years ago in a recording for a Southern Television production (my father was a sound technician) And the coincidence that just delighted me is, my Father is called Keir! Fancy meeting you here like that! Ah, those were the days – I remember them well. Hello Dad, you found it..how marvellous is this! Thank you Dave. Forgive my late reply to your comments. I’m thrilled that you bumped into each other here! As far as the Takamui is concerned, send me a private note, Katherine, if you are still looking for one. The name “Keir” in Danish (I was told) means something like “cabbage”. I haven’t checked. Very interested, Katherine, with your dad’s work with John Williams. Ha! it’s a connection, however apparently humble. Mahler and Sibelius? What can you say..?